I would like you to confirm that I am OK to dive. I am a reasonably fit woman of 53 years. I gained my advanced open water PADI Certification in January this year and I am off next month with the family on a diving holiday. However, it has been on my mind to check if it was OK for me to dive. I was diagnosed with Polymyalgia Rheumatica 5 years ago, and I have been taking steroids for most of that time, (continually trying to get off them). The stiffness and inflammation keeps recurring for some reason? Anyway at the moment I am trying to reduce the dose to 3/4mgs on alternate days (Prednisolone) with a view to getting off them completely once and for all. Since I have been on steroids my doctor has urged me to take HRT to reduce any chance of osteoporosis (father has it). My bone density is OK at the moment (scan last year). I am also taking Thyroxine since they discovered a thyroid problem when analysing some blood tests a few years ago (75 mgs daily). A problem which I was unaware of! So as you can see I am taking all these pills daily and would be glad to get rid of the lot! My only problem in diving has been the usual, ie. equalising at shallow depths. Last time I went I had several small nose bleeds on surfacing, I hope this is not indicative of a problem? Am I safe to dive? As a family it is a very enjoyable pastime and I would be loath to give it up. Bad luck with the triple drug whammy, it must be a bore taking that lot each day, but as I say to my patients who are in a similar situation, you eat 2 or 3 times a day so just think of the tablets in the same sort of way. Polymyalgia Rheumatica is a condition where the sufferer gets arthritic pains around the more central joints of the body. The shoulder and hips are usually affected. If you are fit and with your treatment don't find that there is a limitation of function then the case for your diving is increased. You can see that if this were a bad case then with poor movement of your hips, finning would be impossible, and I would think that if you couldn't move your shoulders, donning a BCD and helping a distressed buddy would be impossible. The other point about long term steroid medication is that it can cause fluid retention. This would be a problem if it were to gather in your lungs and prevent you from breathing properly when you were exercising hard on a tough dive. You need to get your lungs checked and even an exercise test to make sure this doesn't happen. In fact I am a bit surprised that you weren't referred to a diving doc before you did the course as you must have ticked "yes" to several questions on the health form. 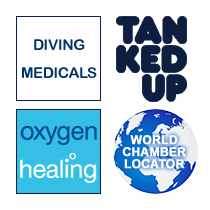 The fact you are on thyroxine isn't a problem with diving. It is a medication you will be on for life so thoughts of coming off it are premature. As it is with the HRT as well. If you have a family history of osteoporosis then there is a high chance you may get it. Taking a daily HRT tablet will seem a tiny burden compared to losing 6 inches from your height and lying in a hospital bed with a hip fracture, which are the sad consequences of osteoporosis later in life. As for the nose bleeds, this is a common problem in new divers who are equalizing incorrectly. This is due to too much too late. What happens is that in the first few metres the diver is more intent on checking gauges than sorting out the middle ear so they have to blow quite hard as the Eustachian tube collapses and becomes hard to open at depth. This can result in burst nasal capillaries. So remember, feet first, little and often and take it slowly down. I am 25 years old and an experienced diver. I seem to be developing arthritis in my hands, feet and knees. No official diagnosis yet, but my sister (who is a doctor in Canada) from hearing my symptoms over the phone seems to believe that it sounds like the start of rheumatoid arthritis, although it is still fairly mild. I am going on a trip soon with a friend of mine and we would like to get in some diving. My doctor here doesn't seem to think that there's anything wrong, since my blood test for RA was negative. Is it safe for me to dive -- should I be taking any precautions. Is there going to be a problem with off-gassing if my joints are swollen, and an increased risk of DCS? It seems you need to get a good firm diagnosis first. It is possible to have what is called a sero-negative arthritis where some arthritic conditions have a normal spectrum of blood tests. Also rheumatoid arthritis itself can be negative on the blood tests yet you could still have the disease. However whatever the diagnosis the only problem with diving is related to whether you are limited in your capacity to fin or help your buddy in an emergency. If your problem means that you cannot walk very far or find that the joint stiffness is so bad that gearing up or holding your buddy in a head up position above water is affected then I would hold back from diving until you are sorted out by a rheumatologist. As for making you more prone to a bend in the joints affected, there is evidence that in old injured joints there may be an increased risk of developing DCS over other parts of the body, but if you dive safely then his shouldn't be a problem. So if you are fit enough then simply dive to your tables and do all your deco stops and all should be fine. My osteopath has just diagnosed me with PMR. I had a blood test taken this morning via my GP - results due in 5 to 7 days - at which point I presume/hope my GP concurs. So to date there is no medicine prescribed. However, how will this affect me diving, assuming I cease to remain quite so immobile and as stiff as a bloody plank? Another acronym for you – PMR stands for Polymyalgia Rheumatica. Ever noticed how we docs attach a long name to diseases for which we don’t know the cause? Here is a classic example. PMR is a debilitating illness which causes stiffness and aching in the muscles of the neck, shoulders, hips and thighs. Sometimes this is so severe that the poor victim becomes bed-bound, literally unable to lift a finger. It also causes fatigue and a general lethargic listlessness. It can come on suddenly after a viral illness but its exact cause is unknown. Most cases occur in the over 50’s and a blood test called ESR (an acronym which would take too long to explain) is used to monitor the condition. Although it cannot be prevented, PMR can be treated with steroids and anti-inflammatories which produce a rapid improvement. Now as far as diving goes, the issues are simply practical ones: would the stiffness stop you from getting suited and booted up for a dive? Would the lethargy impede your ability to fin and exercise underwater? These are questions that would need an individual assessment, and the answers might vary with time. The medications are perfectly compatible with diving, at least initially, so as long as you had no side effects these would not be an issue. On that last point (and this is looking a long way ahead), some PMR sufferers have to be on steroids for so long that their bone-thinning and fluid-retaining side effects can become a problem, and a set of lung function tests is required. At this stage though, a bit of physio and some brisk weight-bearing exercise will often work wonders for the skeletal flexibility so your days of stiffness will hopefully soon be over. As a regular reader of Sport Diver, I often read your spread with interest and sadly at this time I'd welcome your opinion about my medical condition. I'm 45 years old and as a younger man I was extremely active, I was a physical training instructor in the Paras and since leaving many years ago have kept up with plenty of running (minus the Bergen and rifle). Four years ago I was diagnosed with osteo-arthritis of my left hip which the consultant was convinced was down to over use due to my earlier activity. Recently the joint has deteriorated. As an instructor I kneel on pool surfaces etc. and I really notice the discomfort and limp noticeably for a while afterwards. After a recent consultation with a specialist I have decided to opt for MoM (Metal on Metal) resurfacing. I asked the specialist if there were any known problems with diving at depth or any other issues and sadly he had no data or knowledge which concerned me as I don't want to go for an op that will end my dive career prematurely. He did however assure me that the joint would not rust. My question in general is how will this affect diving and also my teaching. I'm sure there must be other divers with the same problem, and any advice on this would be greatly appreciated. This is the classic “wear and tear” arthritis that prematurely grinds down the hips and knees of athletes, particularly runners. The hip is a ball and socket joint, and as it wears out the area becomes stiff and gives constant pain that eventually limits even walking. The approaches to dealing with this are twofold. You can either replace the whole joint, which involves hammering, fairly brutally, a metal stem into the thigh bone, or you can carve away the worn areas of the existing joint and reline them with metal equivalents, which has several advantages: less bone removal, a more stable joint and a greater range of movement. One website offering resurfacing goes by the wonderfully apt name of www.zimmer.co.uk – thankfully not a frame in sight though. After 20 years of practice the orthopaedic surgeons are exceedingly good at doing this procedure. Diving-wise you need not worry. It will not rust! Because the prostheses are solid with no gas-filled spaces they will not be affected by pressure or depth. Obviously you will need to wait until the wound is healed and you are back to full weight-bearing activities before diving, as climbing a boat ladder with a twin set and wet dive gear puts a huge amount of strain on the back and hip joints. There are unsubstantiated theories about scar tissue from surgery taking up nitrogen preferentially (ie. making you more prone to DCI), but as yet these have no hard data to back them up. So hold tight for a little longer and you will soon be giant-striding like a youngster again. Last year I completed my PADI scuba diving course in the Maldives. Whilst I was learning to dive I did not suffer any problems, however when I returned home I was informed that I have Rheumatoid arthritis. I only have hand and wrist problems that leave me unable to lift heavy items. I am travelling to Grenada in three weeks and would like to know what I can do before I go to ensure I will be able to complete my goal of becoming an Open Water Diver. My doctor has said that she believes there will not be an issue with my scuba diving, however, she said the most likely thing to happen is that my hands hurt as the air compresses. Please could you advise me on any information that might help, Many thanks. Well for starters get a better doctor. They should really know that only air compresses as you go deeper. Not bones. Not wrists and especially not arthritic ones. Bad luck with that diagnosis by the way. Make sure it is correct though, before they pump you full of gut-busting anti-inflammatories, gold salts and penicillamine. There is such a thing as a false positive result. The only issues with rheumatoid arthritis are in the initial stages – does it affect your ability to kit up, dive safely and save a buddy in distress? If it does, then use your common sense in what you do. Get the boatman to heave the BCD and tank onto your back. Make sure your fingers are springy enough to inflate and deflate your BCD etc. Later in this chronic disease worse problems can come. Lungs may stiffen decreasing your ability to exhale all that pressurised gas. So, if you get a bit short of breath, have regular medicals to check your lung volume and FEV1. That’s a measure of how much air you can exhale in a second. A poor result here could mean you may get air trapping and a pulmonary barotrauma on ascent. Pink frothy sputum and a Coastguard Chinook air-evac happen with that.